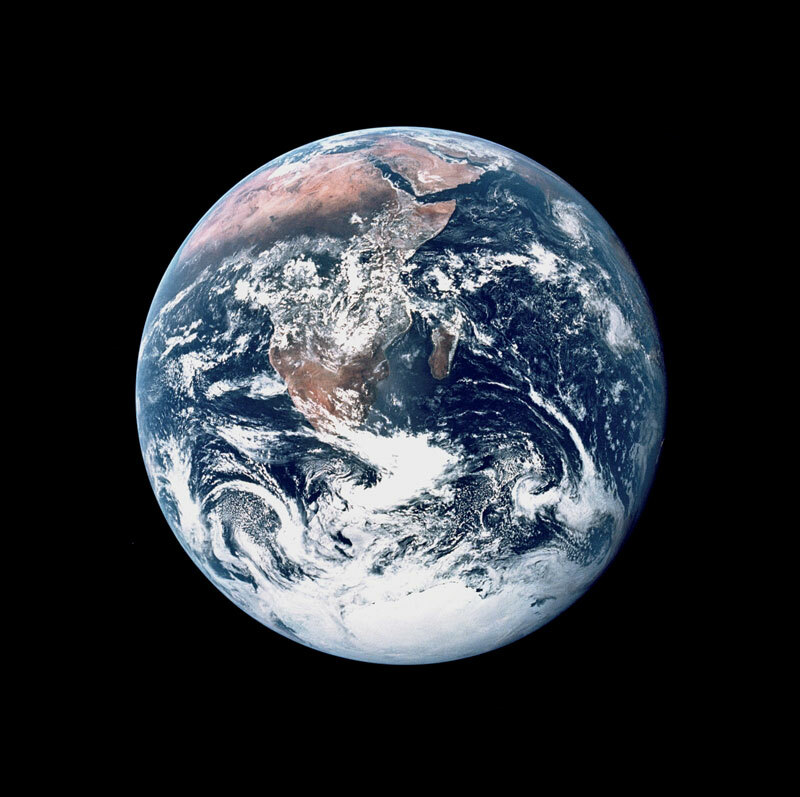 The “Blue Marble” photo of Earth shot from Apollo 17, the last of NASA’s Apollo missions as the rocket ship was hurtling toward the moon, wasn’t the first satellite image of our planet, but it was the first full image—stunning in color—taken from some 18,000 miles in space, with the sun fully illuminating Earth. The south polar ice cap, despite heavy cloud cover, was clearly captured, and the photo showed almost the entire coastline of Africa, extending from Antarctica to the Mediterranean Sea. Most of us who saw it at that time were stunned with how much water covered our planet. This one single dramatic image eventually gave the name “Blue Planet” to our Earth1, due obviously to the abundant water sources we could see on its surface. The photo was taken on December 17, 1972 and for all of us at that time, caught up in the exploits of the space discovery, it forever altered the comprehension of our planet. Now, when I think of Earth, and when hundreds of millions of others think of Earth, this is the iconic image that comes to mind. This is an article about clean water, about water from a tap or from a glass, hopefully free of pathogens that bring disease. This is an article about clay pots and large plantain leaves and cupped dried gourds that hold rainfall hopefully untainted by acid effluviums. This is an article about pole wells drilled beneath polluted soil, and the unintended arsenic poisoning of villagers. This is an article about drying water reservoirs, about waste and sewage and chemicals polluting streams and rivers and major waterways. It is about encroaching urban development laying acres of implacable concrete and miles of roadways over land where rains can now no longer replenish water tables. It is an article about taking responsibility for that Blue Planet spinning alone, and as far as science now knows, unparalleled in our universe. No liquid water has been confirmed as existing on any other planet in our solar system. As yet, not a single drop of water has been detected anywhere in interstellar space. Scientists have determined that only a planet of the right mass, the right chemical composition and the right location can support liquid water; in other words, a planet like ours, the Blue Planet, this Earth. 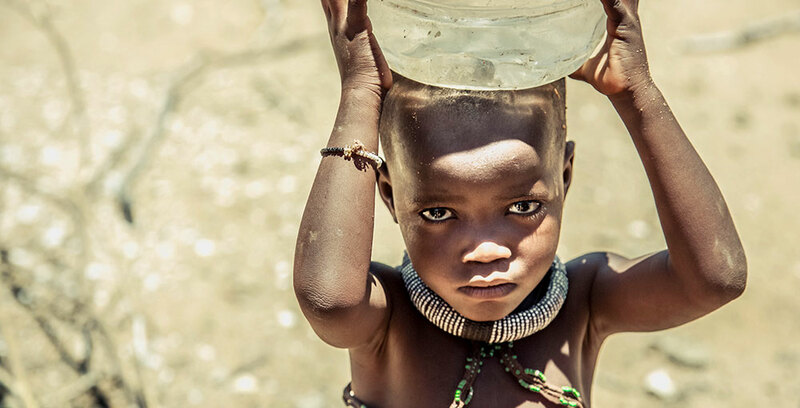 663 million people around the world do not have access to safe drinking water as of 2015C1. This is the first time the number has fallen below 700 million. Just imagine: God looking at the actuality of what that splendid photo AS17-148-22727 replicates. Who can refuse to admit to experiencing a similar and deep soul sigh, it is good. It is very good . . .? According to United States Geological Survey (USGS), “The Earth is a watery place. But just how much water exists on, in, and above our planet? About 71 percent of the Earth’s surface is water-covered, and the oceans hold about 96.5 percent of all Earth’s water. Water also exists in the air as water vapor, in rivers and lakes, in icecaps and glaciers, in the ground as soil moisture and in aquifers, and even in you and your dog.”2 I’m not sure about water content in the animal species, but data informs me that adult males are about 60 percent water and adult females are about 55 percent water. São Paulo, Brazil’s financial capital. Bangalore, India, where rapid growth as a technological hub outstrips advancements to the city’s plumbing, resulting in half its drinking water lost to waste. Beijing, China; the country is home to some 20 percent of the world’s population but whose continent has only 7 percent of the world’s fresh water. Cairo, Egypt, where the major water source, the River Nile, is the increasing destination of untreated agricultural pollutants and residential waste. Jakarta, Indonesia, where rising sea levels with saline water have resulted in 40 percent of Jakarta to be below sea level. Moscow, Russia, where 70 percent of the water supply is dependent upon surface water, but pollution, a leftover from the USSR industrial legacy, has contributed to the fact that 35 percent to 60 percent of total drinking water reserves do not meet sanitary standards. Istanbul, Turkey, which is now technically in water stress. Experts have warned that, if not checked, the situation could worsen to water scarcity by 2030. The city’s reservoir levels declined to less than 30 percent of capacity in 2014. Mexico City, Mexico, where 1 in 5 residents have tap water only a few hours a week, and another 20 percent have running water just part of the day. London, England, where the city draws 80 percent of its water from the Thames and the Lea rivers, has a waste rate of 25 percent, and consequently is predicted to have serious shortages by 2040. Tokyo, Japan, which is now initiating plans to collect rainwater due to its high precipitation—some 750 private and public buildings in the city have water collection and utilization systems. Miami, Florida, is suffering from an earlier project to drain its swamps, causing the unforeseen problem of the Atlantic Ocean rising as water warms and now contaminating the Biscayne Aquifer—the city’s main source of fresh water—and causing closure of nearby outlying wells due to saline infusion. Studying this list makes one point crystal clear: Even if I (or you) may not be personally affected by water emergencies in the areas where we individually live, modern urbanized cities across the entire Blue Planet are now under water duress. They serve as the early warning systems that demand global attention! Attention! Attention! In addition, problems that were ignored 20 years ago are in need of urgent correction now, as are other situations that now need corrections in order to prevent water disasters in the near future. Capacity: Does the infrastructure’s capacity meet current and future demands? Condition: What is the infrastructure’s existing and near-future physical condition? Funding: What is the current level of funding from all levels of government for the infrastructure category as compared to the estimated funding need? Future Need: What is the cost to improve the infrastructure? Will future funding prospects address the need? Operation and Maintenance: What is the owners’ ability to operate and maintain the infrastructure properly? Is the infrastructure in compliance with government regulations? Public Safety: To what extent is the public’s safety jeopardized by the condition of the infrastructure, and what could be the consequences of failure? Resilience: What is the infrastructure system’s capability to prevent or protect against significant multi-hazard threats and incidents? How able is it to quickly recover and reconstitute critical services with minimum consequences for public safety, health, the economy, and national security? Innovation: What new and innovative techniques, materials, technologies, and delivery methods are being implemented to improve the infrastructure? These are the analytics that need to be explained in any discussions of America’s infrastructure hazards, and they are the modes for diagnosing our failing and crumbling public systems, upon which we are all dependent. Consequently, because of its looming water emergency, the thriving city of Cape Town has become the poster city for what, if the necessary correctives are not applied, will be water-scarcity crises duplicated in other large cities worldwide. Even now, that crisis is a reality for millions living in a world where the alarming estimate is that by 2025 half the world’s populations will be living in water-stressed areas. Cape Town, South Africa (population 433,688), where the taps are scheduled to run dry due to extended drought that has emptied the water reservoirs. Any discussion of clean water inevitably introduces the twin dilemma on the matter of how the world handles human waste. Author Colopy’s point is even now an issue with the state of California, which has concluded that intermittent periods of drought may be the predicted future for its residents. Recycled and purified toilet water (and other grey water from washing machines, dishwashers, showers and sinks, gutters and sidewalks) is the basis for the Orange County Water District pioneering wastewater treatment facility that basically recycles sewage and returns it directly to the drinking supply. Soon, some 100 million gallons per day will meet the water needs of some 850,000 people. When mixed with the groundwater supply, this treatment reaches more than 70 percent of Orange County residents. Admittedly, the concept of “from toilet to tap,” as the phrase goes, has met with determined resistance, but due to a three-year water shortage crisis and to determined public education, negative reaction seems to be lessening. A public campaign8 has carefully explained the three steps of the water reclamation project. Micro-filtration removes solids, oils and bacteria, all before the water goes through reverse osmosis. Everything is pushed through a fine plastic membrane that filters our viruses and pharmaceuticals. The water is treated with UV light to remove any other organic compounds. The OCWD assures the end-user that the re-treated water exceeds all state and federal drinking standards. As the technology is adapted to other places in the world, water-insecure Singapore, for instance, in addition to new state-side additions launched in Los Angeles, San Francisco and San Diego, the president of the World Water Council, Benedito Braga, reports, “The quality [of effluent water from a sewage treatment plant] is very good, as good or better than the tap water in any city in the developed world.” Thomas Quinn, the head of the Association of California Water Agencies insists this process is a central strategy to drought-proofing modern urban economies. For those who shudder at the possibility of drinking recycled toilet water, sometimes it is all a matter of what’s in a name. An interview over National Public Radio9 acknowledged the “yuck” factor many in the public might naturally feel at the thought of recycling water from the toilet to the tap, and that resistance might be helped by a newer nomenclature such as the “the potable reuse project.” The Orange County Water District is being far more upfront in their public campaign by using the hashtag #GetOverIt. NPR Reporter, Nathan Rott, insists that recycled water is and will remain California’s single largest source of new water supplies as the state moves forward into the 21st century. Then before we turn to the water dilemmas of the two-thirds world and point a finger and tsk-tsk over spoiled rivers and sewage-polluted streams, perhaps we should look hard at the infrastructure inadequacies of our own nation. The news cycles in the States and the headline-oriented emphasis of major networks and cable outreaches leaves little time for in-depth reporting. We have heard, for many years, much discussion regarding the national need for infrastructure renovation—Roads are in disrepair, bridges are crumbling, airports all need upgrading. Rarely—rarely—do we hear that our water infrastructure systems are also in red flag conditions. The sad result of what is essentially a violation of public trust can be encapsulated by the Flint, Michigan, water saga that happened in April 201410. The drinking source for this city was diverted from the treated Detroit Water and Sewerage Department to the Flint River. This change was influenced by the fact that an estimated $5,000,000 in savings was projected over the next two years. In August and September of 2014, city officials detected levels of coliform bacteria, and a bulletin was issued for Flint citizens to boil their water. In October 2014, General Motors complained about the corrosivity of the water, explaining that car parts were actually corroding. The request was made that GM be able to switch back to the Detroit water source. (It turns out, that corrosive capability of the Flint River water would be determined to also corrode upon lead pipes, leaching lead levels into the water supply of individual homes. An early investigation by one “whistle-blowing” worker determined that, despite standard practice, officials failed to apply corrosion inhibitors to the Flint River water.) In January 2015, in a public meeting, citizens complained about bad water—murky tap water; there was a bad smell and taste as well as the questionable appearance. These complaints appeared to have gone on over an 18-month period before a local physician, taking it upon himself, found highly elevated blood lead levels in the children of Flint. Some homes in Flint, Michigan had lead levels 880 times higher than the federal allotted level. Eventually, with city officials dodging complaints, issuing false reports to state regulators indicating that “tests at Flint’s water treatment plant had detected no lead and testing in homes had registered lead at acceptable levels,” and with Michigan’s Department of Environmental Quality eventually being pegged as the major player in denying the problem and refusing to take action, major players, too numerous to mention, finally stepped in. Scientists and physicians and medical schools and environmental organizations, both private and governmental, determined that the proportion of infants and children with elevated levels of lead in their blood had nearly doubled since the switch to the Flint River. This all, of course, has resulted in countless hearings, investigations, and continued studies on the local, statewide and national levels. Emergency centers for distributing water and home filters, then replacement cartridges, have been established. Testing water and lead levels in the blood of children continue. The water supply was diverted back to the Detroit Water and Sewerage Department. Numerous Class action suits have been filed against Michigan Governor Rick Snyder and 13 other state officials, including former Flint mayor Dayne Walling. The complaints allege that the officials acted recklessly and negligently, leading to serious injuries from lead poisoning. Needless to say, major funding has been found and pledged for comprehensive water infrastructure improvement, all to be carried out over the next few years. But what is immeasurable is the damage done to the brains of small children, most of which cannot now be determined but which bodes ill for the future of these kids. Senators Debbie Stabenow and Gary Peters along with Representative Dan Kildee called upon the state of Michigan to “make a sustained financial commitment by establishing a Future Fund to meet the cognitive, behavioral and health challenges of children affected by lead poisoning.” All fear that those challenges will be real and life-lasting. So let us take a deep breath. Let us think a moment about that peaceful and stunning NASA photo: AS17-148-22727. Let us remind ourselves that of all the spinning planets in our solar system, it alone has been created uniquely to sustain water, and that not one other drop has been discovered anywhere else in interstellar space. Let us remember that 75 percent of our planet is covered with water, some 96.5 percent of that in its oceans. Then let us say a prayer for its water resource preservation and purification, and let us remember that some religious systems view water to be holy. Only then, let us absorb the fact that an investigative report11 by Reuters released December 19, 2016, found nearly 3,000 areas in the United States with lead poisoning rates at least double those in Flint. This headline tagged a report12 released by the Associated General Contractors (AGC): “Both Public and Private Studies Find Astounding Gaps Between Current Spending and Projected Needs.” The analysis determined: “Modernizing and replacing aging water infrastructure may be the single largest public works endeavor in our nation’s history. The U.S. Environmental Protection Agency’s Clean Water and Drinking Water Infrastructure Gap analysis found a $540 billion gap between current spending and projected needs for water and wastewater infrastructure (combined) over 20 years. Other public studies conducted by the Government Accountability Office (GAO) and the Congressional Budget Office (CBO), and a private study produced by AGC partner, the Water Infrastructure Network, have similarly estimated the nation’s water infrastructure needs to range between $400 and $600 billion over a 20-year period. 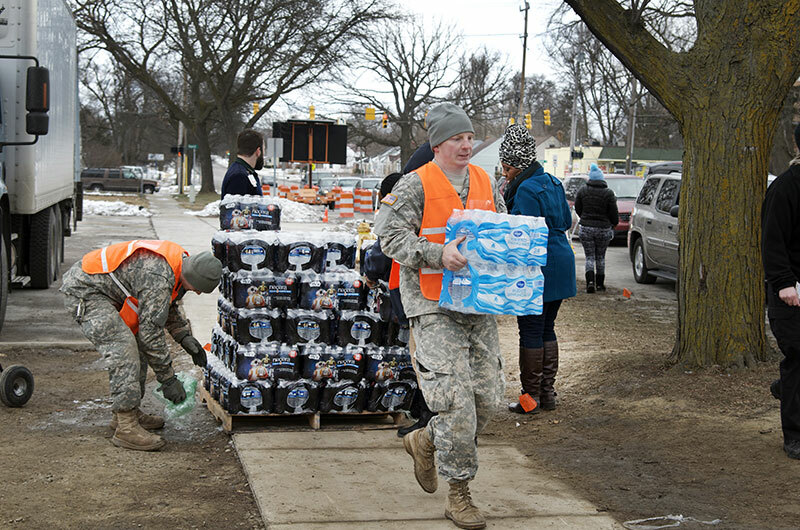 The 2014–2017 Flint, Michigan lead-poisoned water problems highlights possible impacts on communities if warnings are ignored and if appropriate budget planning is not prioritized. (“What is happening to us in Cape Town may not be an outlier. It could happen to you too.”) We need to understand that water degradation and evaporation and infrastructure decline is happening to us now. In Gayo Village, Ethiopia, a group of women and young girls collect water from a rain water pool. They use tablets to purify the water before they drink it. Around the world, mostly women and children bear the burden of collecting water for their families. of the global population in 2015 (5.2 billion people) used a safely managed drinking-water service—that is, one located on premises, available when needed, and free from contamination. of the global population in 2015 (6.5 billion people) used at least a basic service. A basic service is an improved drinking-water source within a round trip of 30 minutes to collect water. people lack even a basic drinking-water service, including 159 million people who are dependent on surface water (water from rivers and ponds). people globally use a drinking water source contaminated with feces. deaths every year are caused by diseases transmitted by contaminated water such as diarrhea, cholera, dysentery, typhoid and polio. of health care facilities lack an improved water source in low- and middle-income countries. 19 percent do not have improved sanitation, and 35 percent lack water and soap for handwashing. Certainly, organizations somehow, somewhere, are doing something about this? Right? This is the natural response of those of us who unthinkingly use clean water to flush our toilets and allow grey water to be piped into the sewer systems of our communities. Actually, that thought many of us have when we read about water-distressed systems worldwide is right. Well-meaning help of all kinds, from missionary groups to hundreds if not thousands of non-government organizations to the World Bank and the United Nations to the World Health Organization to inter-agency coordinated efforts to private foundations with substantial granting means to individual governments to the largess of western countries—all of them are players in attempting to solve the water problems of the world. Many wells drilled by well-meaning organizations now lie broken or in disrepair. The equivalent of up to $360 million USD has been wasted on building borehole wells that break because they are not maintained or repaired. Only one third of water points built by NGOs in Senegal’s Kaolack region are working, and 58 percent in northern Ghana are in disrepair. Disrepair occurs because NGOs often do not fully consult with local people before beginning a water project to determine what it will cost to clean and maintain the well. Some naysayers have deemed this come-do-your-thing-and-go approach as “non-government organizational malfeasance.” Skinner gives the example of a badly constructed and poorly maintained shallow well, dug by a charity in Katine sub county in north-east Uganda, that was full of soil and animal feces and was making the local population sick. The African Medical and Research Foundation’s strategy to solve this well deficiency was to set up a local committee responsible to operate and maintain a new borehole with trained hand-pump repairmen available in case of breakdown. “There is no point in an external agency coming in, putting in a drill-hole and then passing it over to the local community if they can’t afford to maintain it over the next 10 or 20 years,” concludes Skinner. In her book Dirty, Sacred Rivers: Confronting South Asia’s Water Crisis, Cheryl Colopy takes us on nearly every footstep of her arduous investigation starting in the headwaters high in the Himalayas. “This book chronicles my travels in Nepal, India, and Bangladesh, countries that are knit together by the Ganga and her various tributaries. I explain what I learned about glaciers melting in the mountains, sewage gluts and water shortages in the vast cities, and plans for engineering rivers that will have unknown consequences and perhaps limited benefits,” she writes in her introduction. Simple is often best. Ancient civilizations solved their water needs in ways that speak to us today. A child of the Himba tribe carries a bucket of water in Kamanjab, Kunene, Namibia. The themes of the book are: Simple is often best. Ancient civilizations solved their water needs in ways that speak to us today. The people who are most affected by water stresses are most often the ones who can solve the problem. Indeed, the problems are real. Agricultural water scarcity: The global water scarcity problem is not limited to providing potable drinking water for humans, although without it we would not exist. Water is necessary for agriculture, for both crops and animal husbandry. 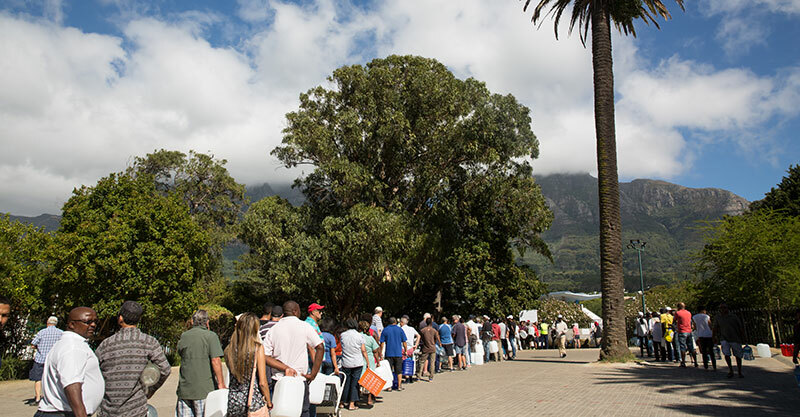 An uncanny sight in a first-world country: Lines of people waiting to collect natural spring water during the drought in Cape Town, South Africa. In water-starved South Africa, the first restrictions on water usage were levied upon the agricultural sector. Now, farmers are renegotiating their leases because they cannot produce enough income. Current economic forecasts anticipate that within the next five years as many as 98 percent of farms will have a negative Net Farm Income15. China’s Ministry of Water Resources recently declared a need “to fight for every drop of water or die.”16 Twelve northern Chinese provinces suffer from water scarcity. In eight, the scarcity is considered acute. This is particularly significant because those provinces provide 38 percent of the country’s agriculture. The rapid economic expansion in China has placed so much demand on water supplies that 28,000 rivers have disappeared over the past 25 years. The flow of the Yellow River has dwindled to a tenth of what it was prior to 1950. Pollution is so rampant in China that almost 10 percent of the groundwater is not even fit for agricultural use. These countries and others are in a catch-22. Water for agriculture is limited, but it is needed to grow the crops and animals required to feed the demands of growing populations. The rapid economic expansion in China has placed so much demand on water supplies that 28,000 rivers have disappeared over the past 25 years. Recognizing the importance of water conservation, the Kerala Water Authority (KWA) in India is making a concerted effort to bring dramatic reform in their own jurisdiction. Infrastructure can cause as much as 45 percent water loss, far above the national average of 15 percent systemic water loss. As the KWA brings improvements to its clean water delivery system, the potential for positive impact is significant17. On the national level, Indian Prime Minister Shri Narendra Modi began promoting the implementation of a decades-old clean water initiative in 2014. One part of that project alone, linking the Ken and Betwa rivers, would make drinking water available for 1.35 million people plus provide enough to irrigate 600,000 hectares of farmable land18. The project is pending approval from the environmental ministry, but nonetheless, we’re hopeful of the efforts making strides to resolve India’s water problems. In 2016, 330 million Indians were affected by drought19, and the government is taking action to respond. “We are working on a big scheme to bring water to farmlands. We need to have a permanent solution to the drought,” the Prime Minister said20. Dr. K.P. Yohannan, founder of Gospel for Asia and Metropolitan of Believers Eastern Church, met with high officials in the government in March 2016 to discuss ways in which India’s Christian community could collaborate with the government for the good of the nation. Believers Eastern Church has since been able to work together with the Indian government to work on cleaning up some of the nation’s rivers. One of those voices Colopy interviewed—a highly intelligent, trained and committed expert—Sudhil Chaudhary, a professor of biology at Bhagalpur University has a plan. His is for forestry restoration, which also involves water reclamation. Sudhil would like local communities to be part of each and every decision about the plan. This is a theme that seems to be emerging all over the world. I find it stated more and more as I research world development needs and particularly, the Millennium Development Goals and its companion the Sustainable Development Goals. Things work when there is community buy-in, and often fail when there is none. For those of us with a Sunday School background, the stories dealing with water are memorable: Moses parting the Red Sea as the children of Israel fled the pursuing chariots of the Egyptians. Moses striking the rock at Horeb so that water flowed in the wilderness to satisfy the thirst of the people and of their flocks. 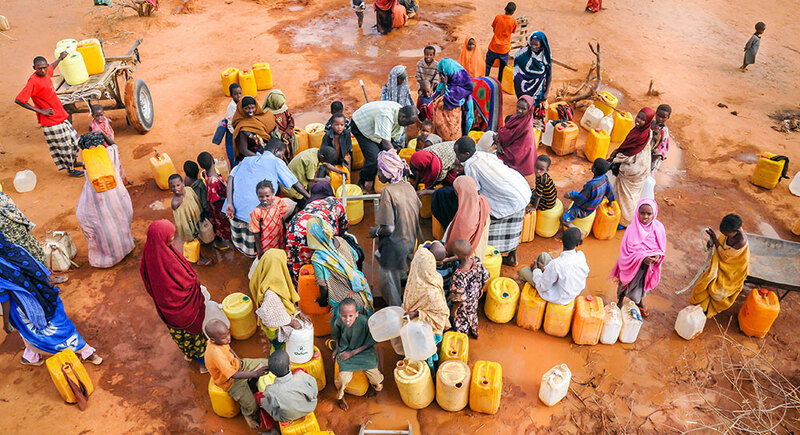 Refugees waiting to get water and satisfy their thirst in a camp in Dadaab, Somalia. Wells are central stages for story-telling dramas: Abraham’s servant finds a bride for Isaac after praying near a well, “Oh, Lord God of my master, Abraham, give me success today and show kindness to my master.” Jesus declares His spiritual authority to a Samaritan woman by a well. “Will you give me a drink?” He asks, to begin a dialogue with her, and then eventually He declares, “But whoever drinks the water I give him will never thirst. Indeed, the water I give him will become in him a spring of water welling up to eternal life” (John 4:14, NIV). Rivers are forded, oases with pools satisfy weary nomads and their families, and always, over and over, water is used as an example of God’s blessing. “And the LORD will continually guide you, and satisfy your desire in scorched places, and give strength to your bones. And you will be like a watered garden, and like a spring of water whose waters do not fail” (Isaiah 58:11, NASB). Water is used as an example of the sacramental, where the holy mixes mysteriously with the physical. People flock to John the Baptist in the wilderness to be baptized for the forgiveness of their sins: “I baptize you with water for repentance. But after me comes one who is more powerful than I, whose sandals I am not worthy to carry. He will baptize you with the Holy Spirit and fire” (Matthew 3:11, NIV). The heavens open after Jesus is baptized, the Spirit descends in the bodily form of a dove, and a voice is heard declaring, “You are My beloved Son; in you I am well-pleased” (Luke 3:22, NKJV). It is a comfort, to know the fragility of our water sources around the globe is taken into account. Because of community involvement and the compassion of pastors from Believers Eastern Church and other affiliate organizations, Dr. K.P. Yohannan spearheaded the “Jesus Well” project among some of the neediest regions in India, even small villages across Asia, spanning multiple Asian nations. In 2016 alone, Gospel for Asia was able to help provide 6,822 wells. That is 6,822 sources of clean, fresh drinking water. GFA supporters around the world have allowed the rate of installation of Jesus Wells to continue and to remain consistent, with tens of thousands of wells drilled and constructed in the past several years. Now, the Jesus Well project is one of the largest clean water initiatives in the world. 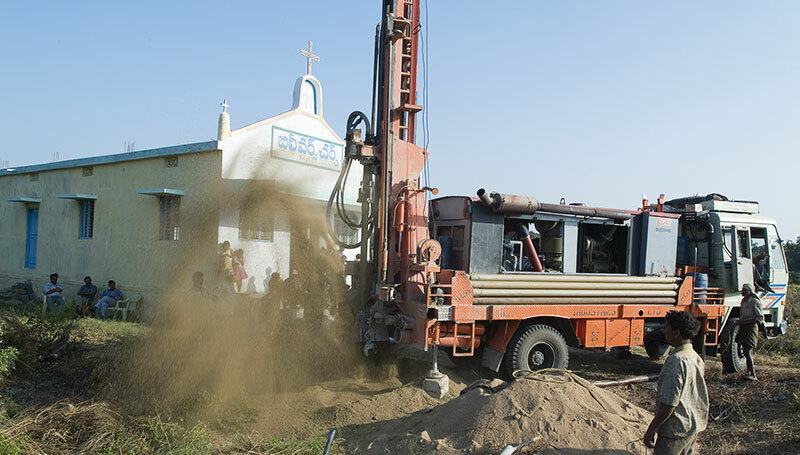 A Jesus Well is being drilled next to a church building. This is the first well dug in the village. Here, there are no broken wells laying waste and abandoned because well-meaning but neglectful charities dug wells that villagers could not maintain or repair. Jesus Wells are maintained in good repair by GFA-supported local pastors. In fact, wherever possible, the wells are dug near local churches, not simply so that they will be maintained, but so that the beneficiaries will recognize that our love for them is genuine, because everyone is able to drink freely—no matter their income or social background. Digging a Jesus Well supports the local economy, because local labor and materials are used to drill the wells. This keeps costs low, often even seven times lower than wells installed by other organizations. Jesus Wells are drilled up to 650 feet deep to ensure a continuous supply of clean water. 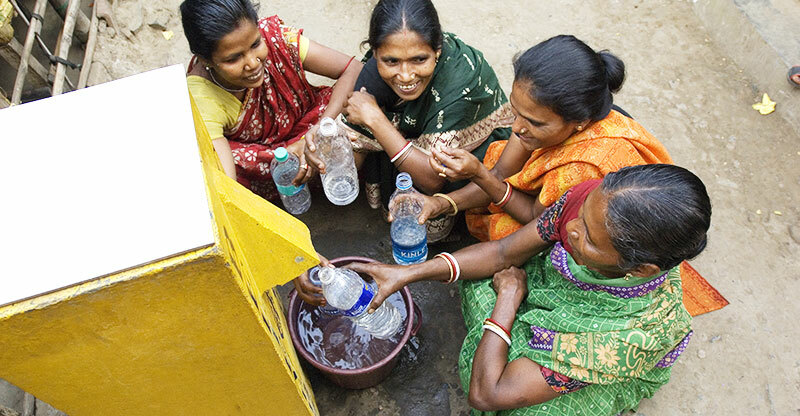 They can last for 20 years and provide clean water for an average of 300 people every day. Some wells serve even more. Though simple in construction, BioSand water filters are easy to use and provide water that is 98 percent pure. In regions where water might be available, but it’s just not safe to drink, GFA-supported workers provide BioSand water filters. 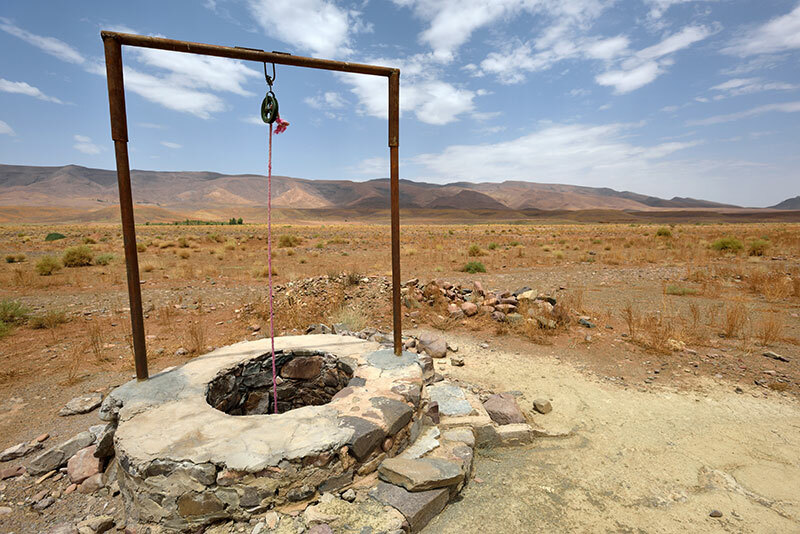 These simple structures—locally built from concrete, sand and rocks—filter the water to remove impurities, providing water for drinking and cooking that is 98 percent pure. In 2016, GFA provided 14,886 BioSand water filters for families and individuals. Gospel for Asia published a story in 2016 that shared the paradox faced by four villages in one region of South Asia. These communities faced severe water shortage during the hot, summer months, but in the rainy monsoon season their water sources were contaminated by chemicals. Their situation was an echo back to Samuel Taylor Coleridge’s poem: “Not a drop to drink.” Local congregations in the region were concerned about the people and their need for clean water, and in 2014, GFA helped drill four Jesus Wells to provide safe, pure water for these villages. 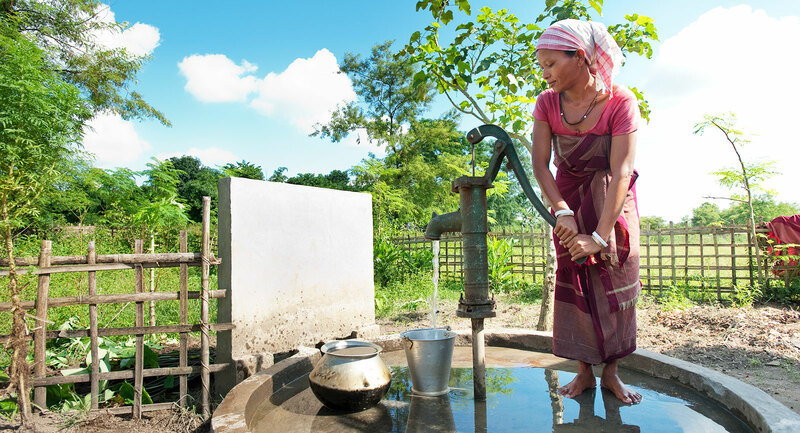 By God’s grace, there are now more than 5,000 people who benefit from these wells! Salil (pictured) lives in a northeastern region of Asia with his wife and three children. The staggering weight of the global clean water problems is beyond the ability of most of us to wrap our minds around. Still, more than 150 million people in South Asia alone have either no immediate access to clean water or drink from polluted sources. But the clean water problem can be devastating for a single family. We see this illustrated in the story of a gentleman named Salil, his wife and his children. Until a Jesus Well was installed in their village, all the water for the community came from a nearby contaminated pond. Salil’s family and the other villagers were sick with a plethora of illnesses and diseases. They suffered because of the very water they depended on for life. The situation drove them even deeper into poverty as their illnesses kept them from work, and their meager income was not adequate to provide for the medicines they needed—let alone their other essential needs. Salil did everything he could think of to provide for his family, but nothing he did was adequate. How appropriate: “And if anyone gives even a cup of cold water to one of these little ones who is my disciple, truly I tell you, that person will certainly not lose their reward” (Matthew 10:42, NIV). Those who receive are blessed, and those who give are blessed. The accompanying video will give you a feel for just what that means. So, our Blue Planet spins in space, obedient to its determined orbit. Its surface is covered by 71 percent water. So far, there has been no verification of liquid water existing on any other planet in our solar system. As yet, not a single drop of water has been detected anywhere in interstellar space, and scientists have determined that only a planet of the right mass, the right chemical composition and the right location can support liquid water. Let us remember that it is good. It is very good. Provide life-saving water through Jesus Wells and BioSand water filters, and help support ongoing maintenance of these clean water projects. Blakeman, Eric. The Smithsonian Institution; www.smithsonian.com. August 23, 2016. Perlman, Howard. The USGS Water Science School. United States Geological Survey. https://water.usgs.gov/edu/earthhowmuch.html. December 2, 2016. Baker, Aryn. When the Taps Run Dry. TIME Magazine. February 2018. BBC News. 11 Cities Experiencing Water Stress. http://www.bbc.com/news/world-42982959. February 11, 2018. Drinking Water Fact Sheet. World Health Organization. http://www.who.int/mediacentre/factsheets/fs391/en/. March 2018. Report on Infrastructure for United States 2017. American Society of Civil Engineers. https://www.infrastructurereportcard.org/ March 2018. Colopy, Cheryl. 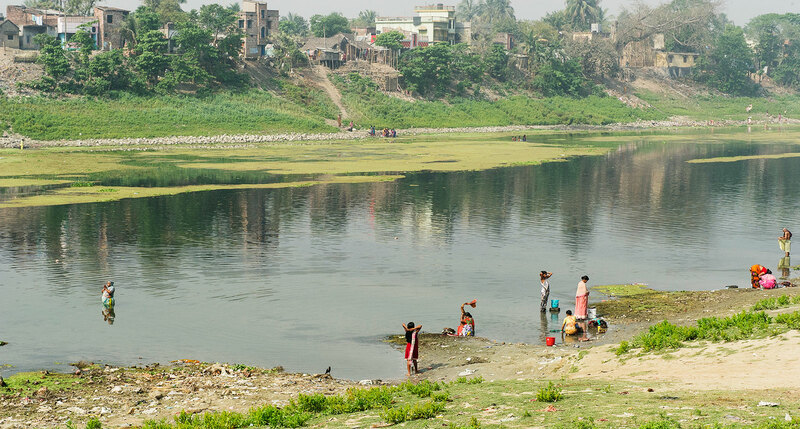 Dirty, Sacred Rivers: Confronting South Asia’s Water Crisis. New York: Oxford University Press, 2012. Monks, Kieron. From toilet to tap: Getting a taste for drinking recycled waste water. CNN News. https://www.cnn.com/2014/05/01/world/from-toilet-to-tap-water/index.html. November 17, 2015. Rott, Nathan. California Aims To Get Past The Yuck Factor Of Recycled Wastewater. National Public Radio. https://www.npr.org/2018/02/20/587195891/california-aims-to-get-past-the-yuck-factor-of-recycled-wastewater. February 20, 2018. Flint, Michigan Water Crisis. Wikipedia. https://en.wikipedia.org/wiki/Flint-water-crises. March 2018. Pell, M.B and Schneyer, Joshua. The thousands of U.S. locales where lead poisoning is worse than in Flint. Reuters. https://www.reuters.com/investigates/special-report/usa-lead-testing/. December 19, 2016. Water Infrastructure Funding. Associated General Contractors of America. https://www.agc.org/water-infrastructure-funding. March 2018. Skinner, Jamie. World Water Forum Report. New Scientist. https://www.newscientist.com/article/dn16835-wasted-wells-fail-to-solve-africas-water-problems January 2009. Kerala Water Authority Expediting Improvements to Water Supply. Missions Box. https://missionsbox.org/news/kerala-water-authority-expediting-improvements-to-water-supply/. March 13, 2018. Chaudhary, Archana. Narendra Modi pursues 1980s plan to solve India’s water shortage. Live Mint. http://www.livemint.com/Politics/f0JrBub3F88aATney45ciI/Narendra-Modi-pursues-1980s-plan-to-solve-Indias-water-shor.html. September 24, 2014. Doshi, Vidhi. India set to start massive project to divert Ganges and Brahmaputra rivers. The Guardian. https://www.theguardian.com/global-development/2016/may/18/india-set-to-start-massive-project-to-divert-ganges-and-brahmaputra-rivers. May 18, 2016. Centre working for permanent solution to drought: PM Modi. DNA India. http://www.dnaindia.com/india/report-centre-working-for-permanent-solution-to-drought-pm-modi-2199692. April 8, 2016. Khapre, Shubhangi. PM asks states to replicate Jalyukta Shivar to tackle water problems. Indian Express. http://indianexpress.com/article/india/pm-asks-states-to-replicate-jalyukta-shivar-to-tackle-water-crisis-4616038/. April 17, 2017. Water, Sanitation and Hygiene Report. World Health Organization. http://www.who.int/water_sanitation_health/monitoring/jmp-2015-key-facts/en/. 2015.